The ethics of nursing and midwifery, and how these were abrogated during the Nazi era. Nurses and midwives actively killed their patients, many of whom were disabled children and infants and patients with mental (and other) illnesses or intellectual disabilities. The book for the first time, explains the role of one of the world's most historically prominent midwifery leaders in the Nazi crimes... "a groundbreaking and chilling historical analysis of a medical system in which death becomes a medical cure and nursing professionals view their allegiance to the state, their superiors and society above that of individual patients." boys into a gas chamber. The care she takes to put a blanket around their shoulders makes us wonder how a nurse, who is educated and trained to think that caring is the platform on which her/his work is based, can regard killing as a legitimate part of that caring. This is the essence of this book. people hold nursing and midwifery in high regard, and believe (as we have been told on several occasions) that "nurses would not do those things". Such unenlightened thinking inhibits full and proper examination of a dark side of the history of nursing and midwifery. Unless this is addressed, we cannot develop the professions to their full potential. of people with a range of illnesses and disabilities. Chapter 2 examines the role played by eugenics in the development of the racially motivated killings in which nurses were complicit. Chapter 3 discusses nursing in Nazi Germany, describing how the profession developed and was structured in that era. Chapter 4 explains how psychiatric nursing was structured in Nazi Germany, and how it was the main specialty of nursing under which the killings were done. Chapter 5 discusses the "euthanasia" programs in detail. Chapter 6 explains the actions of nurses at Meseritz-Obrawalde, one of the psychiatric hospitals that were killing centers, and, using trial transcripts, examines the nurses' justifications for their roles in murder. of the nurses who killed. program can be taught to nurses and midwives today. and some reflections on how similar things are happening in twenty-first century nursing and midwifery practice. The book is available for download on online reading here. at the University of Texas Health Science Center School of Nursing in Houston. Professor, School of Medi­cine,The University of Queensland. The bottom line of a new New Jersey law is that breaking the law pays off, according to a Rutgers University student angered over a law that lets illegal immigrants collect financial aid. Democratic New Jersey Gov. Phil Murphy put a very different spin on the bill when he allowed New Jersey to become the ninth state in the U.S. to dole out financial aid to illegal immigrants. “New Jerseyans support the ability of our Dreamers to not only remain in our state but to become a strong and contributing part of our society and economy,” he said, according to NJ.com. “By allowing them to not only go to college but to qualify for financial assistance, we are living up to that ideal,” he said. The battle over financial aid to illegal immigrants is currently being fought in New Jersey’s neighbor, New York. For the past seven years, the Democrat-controlled New York State Assembly has passed legislation that would allow the children of illegal immigrants to receive financial aid. However, the GOP-controlled state Senate has refused to approve the bill, which has received support from Democratic Gov. Andrew Cuomo. Illegal immigrants and their supporters are demanding that New York follow New Jersey’s lead and putting heat on Cuomo, who is facing a primary challenge from actress Cynthia Nixon, to get the job done. “I am disappointed that Gov. Cuomo and the State Senate have not introduced a similar bill, which would change our lives. New York needs to follow the example of New Jersey and provide the same access to higher education to all students, regardless of their immigration status,” said Jennifer Macías, an illegal immigrant who attends Queensborough Community College, according to Voices of NY. New York State Senate Majority Leader John Flanagan has said his GOP colleagues are unlikely to change the stance on financial aid for illegal immigrants. “Our members are very strongly opposed to the Dream Act,” he told the Albany Times-Union. In 1938, just a few years prior to the American Birth Control League (ABCL) changing its name to Planned Parenthood, which today is the largest abortion provider in the nation, a group of American Eugenics Society Members and members of Margaret Sanger's American Birth Control League (ABCL) formed the National Society for the Legalization of Euthanasia. Also on this board was Sidney Goldstein who sat on the American Birth Control League's National Council and later was on Planned Parenthood's Board of Directors. Another member was Frank H. Hankins who was a managing editor for Planned Parenthood founder, Margaret Sanger's newsletter called the Birth Control Review. Hankins was also an American Eugenics Society member. Mrs. F. Robertson Jones was also on this panel, she was an ABCL President, wrote for Sanger's Birth Control Review, and was an honorary board member of Planned Parenthood-World Population and a Board of Director of Planned Parenthood. ABCL Citizen's Committee for Planned Parenthood member, Dr. Foster Kennedy, was also on the panel. 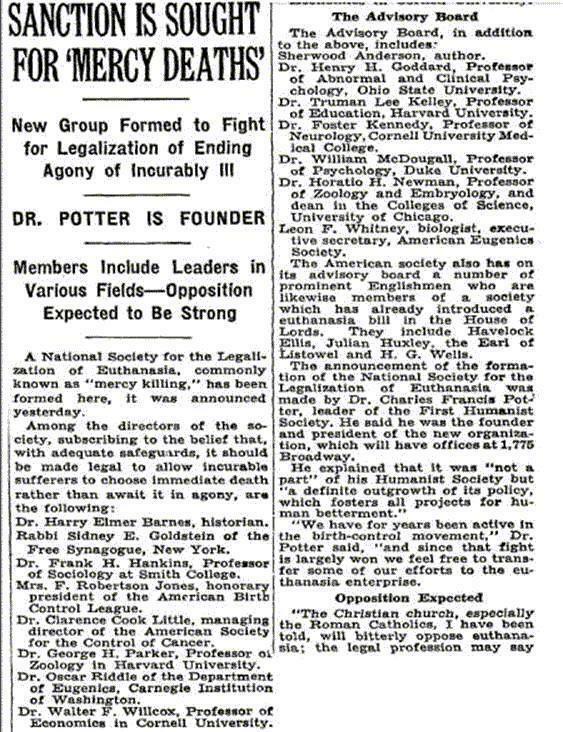 American Eugenics Society Member, Clarence Cook Little was the President of Margaret Sanger's American Birth Control League (ABCL), at the same time he was on this pro-euthanasia panel. American Eugenics Society founder and friend to Margaret Sanger, Leon Whitney, also sat on this panel. Whitney advocated forced sterilization, was published in Sanger' Birth Control Review, and openly praised Adolf Hitler for his Nazi effort. It is unclear why Planned Parenthood founder, Margaret Sanger was not listed on the above article because Sanger was clearly involved in the Euthanasia Society. Sanger was a member of the American Eugenics Society and many of their members were on this panel. Sanger admitted that she gave a speech to the Klu Klu Klan and in her autobiography, she bragged that she received a dozen invites from the Klan for further speeches. By 1952, Margaret Sanger was open about her belief in Euthanasia. Also listed is Harry Emerson Fosdick, who was a recipient of the Albert Lasker Awards Given by Planned Parenthood in 1953. Henry H. Goddard is also listed and he was published in Margaret Sanger's book, The Case for Birth Control. Frank H. Hankins is listed on the Board of Director his associations are listed above. Charles Francis Potter was founder of the Humanist Society and in 1924 Margaret Sanger wrote an Introduction for Charles Francis Potter. Potter was active in the Rhode Island Maternal Health Association, which he served as medical director, as well as Planned Parenthood. He was a member of the American, Rhode Island, and Providence medical societies. In 1967, Dr. Potter was awarded the Margaret Sanger Medal by Planned Parenthood for outstanding service to family planning, after he served 11 years as medical director of its clinic. President of the Euthanasia Society was Mrs. F Robertson Jones who was also on Margaret Sanger's ABCL board. We would later discover that RL Dickinson was President of the Euthanasia Society and Senior VP of Planned Parenthood Federation of America. In 2012 PETER GOODWIN, MD ended his life in accordance with Oregon's Measure 16 'Death with Dignity Act,' the landmark legislation that he helped craft and champion into law in 1997. Aside from publicly advocating for Measure 16, he served as chairman of the Oregon Death with Dignity Committee. He was also a member of the Planned Parenthood of Columbia/Willamette board. In 1964, Evelyn Ames co-founded the Planned Parenthood Association of Nashville. She served as the organization's southeastern representative for nine southern states, and on the executive committee of the national board of directors of Planned Parenthood-World Population. She was also a founder and member of the board of the Nashville chapter of Concern for Dying, an advocacy group for the right to die. Ames Davis died in 1993. Esther Instebo delivered donations and filled fundraiser tables for Planned Parenthood and Washington politicians. Instebo pulled her friends into Democratic Party politics. Instebo worked with the euthanasia organization Compassion & Choices to qualify for help in dying under the state's Death with Dignity law. Knowing that she had that option greatly improved the quality of the last six months of her life because she knew she wouldn't have to put up with what she was afraid of. According to researcher, Rita Dillar, when Compassion & Choices, formerly The Hemlock Society, convened its June 2012 conference, former Planned Parenthood insider Theresa Connor was a featured speaker. She was public policy director for Planned Parenthood in Washington state for 15 years and instituted the research and strategy behind the 2001 Erickson v. Bartell case that required employers/ insurance plans to cover prescription birth control under anti-discrimination laws. A major funder of the new bioethics Hastings Center was Monsanto [http://www.philanthropyroundtable.org/topic/excellence_in_philanthropy/philanthropys_brave_new_world]. Another organization birthed out of the American Eugenics Society was Planned Parenthood, headed by William Gates, father of Bill Gates. Bill & Melinda Gates Foundation currently funds the use of midwives in Indonesia to improve access to family planning. [http://www.impatientoptimists.org/Posts/2014/01/Midwives-Critical-Players-in-Delivering-Family-Planning-in-Indonesia], as do WHO, UNFPA, UNICEF, and the World Bank [http://whqlibdoc.who.int/publications/2007/9241545879_eng.pdf] -- and the Population Council [http://www.lifesitenews.com/news/population-control-advocates-plan-to-expand-abortion-through-midwives]. The Population Council works hard to provide 'safe abortions' around the globe [http://www.popcouncil.org/research/safe-abortion-and-postabortion-care].